As all parents know, it is one of the most beautiful milestones when a child takes his first steps. For us the experience was no less dramatic even if it happened 12 years later than average. 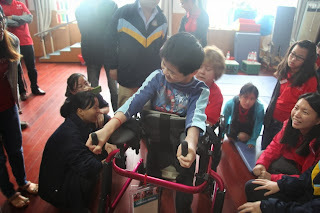 We first met our young friend a year ago when we started working with another orphanage in China. Our friend has Cerebral Palsy, a neurologic disorder and that makes it extremely difficult to control her muscles and limbs. She is really smart, even though she has had no schooling. We just couldn't get her out of our minds remembering how she just sat in a chair all day trying to practice Chinese characters in a little paper book. We thought it might be good to show the therapists at the orphanage how a child like this might be helped using a specialized gait trainer. It's a little more involved that a standard reverse walker as there is adjustable supports in key areas in the frame. 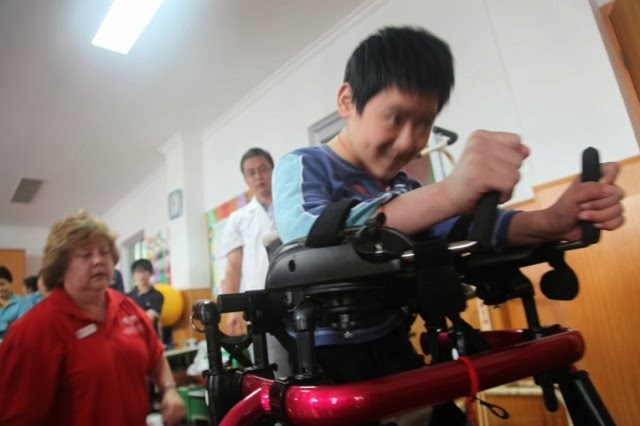 Our PT, Susan from U of M has had great success with children here in the US. So we put out a plea for donations. 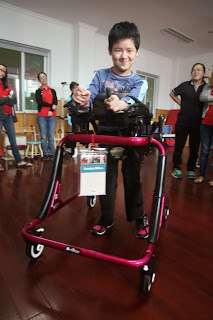 We were so happy when we finally raised enough money to purchase the gait trainer. The Rifton company gave us a charitable discount as well! Vivian found out her favorite color so of course we ordered one in pink! We hauled that gigantic box to the airport and then the bus to Hanghou, and then the bus to Ningbo. As Susan wheeled the gait trainer in and told our little friend she was going to help her walk, her eyes got wide and she smiled from ear to ear. It was like getting a brand new bike for Christmas! No, maybe a brand new convertible! And guess what. She walked immediately. All around the room. She intuitively steered her new ride wherever she wanted to go. Yeah, not a dry eye in the house. Plus it matches her shoes. 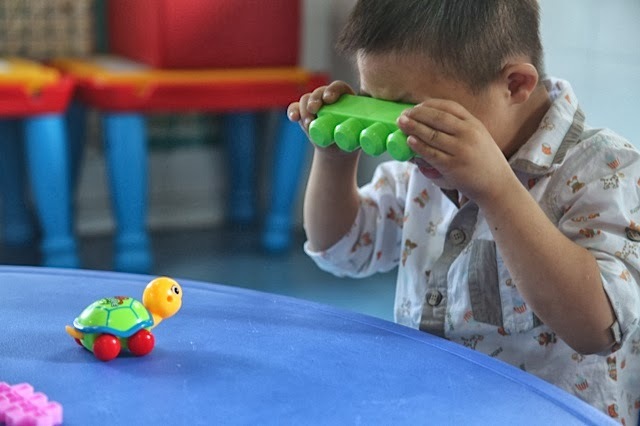 We are sure having fun with the kids in China. It was wonderful to see our little friends on our stopover in Hangzhou. I guess they are getting pretty used to a cameras because here is a budding photographer who also wanted to take a picture of one of his little friends.